Embark on a journey with XploreSG, learn about the history and culture of the sunny island by foot. Discover the city's best well-kept secrets and the different dacades of Singapore on a walkabout of the tourist track. Come! Join our Day Tour taking you on fusion of both Hertiage and Modern places of Singapore Such as Kampong Glam, Clark Quay, River Cruise and more! Kindly click here to view more details. You can also choose to join the Night Tour to view the gorgeous night scenery of Singapore skyline, located at Marina Bay. Visit places such as the Art Science Museum, Esplanade, Singapore Flyer and More! Kindly click here to view more details. Please reach the meet up point by 3.45PM sharp. Please reach the meet up point by 7.45PM sharp. Latecomers will need to attend the tour the next day. 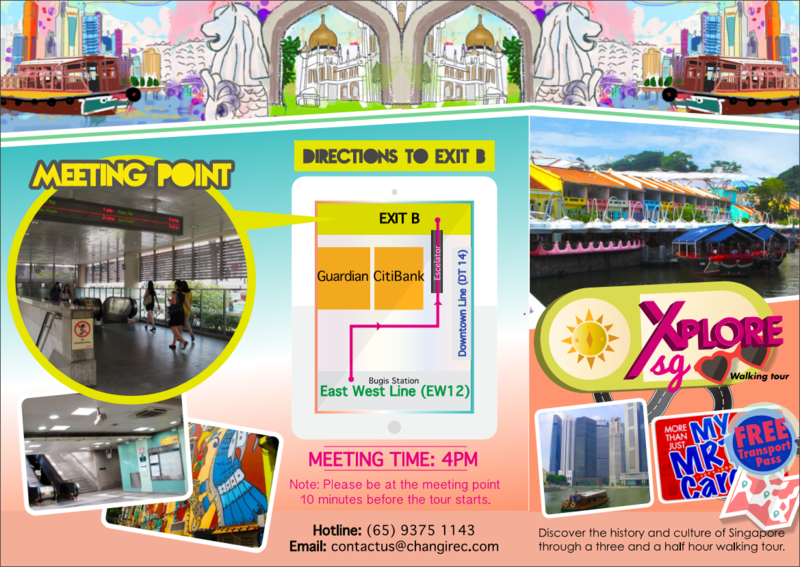 Day Tour: Please meet at BUGIS MRT Station Exit "B" before the tour. Kindly click here to view more details. Night Tour: Please meet at BayFront MRT Station EXIT "D", in front of 7-11 shop before the tour. Kindly click here to view more details.